What better way to celebrate 55 years of marriage and our birthdays than to spend our magical month, September, in Portugal; one week in our winter home, Ponta Delgada, São Miguel, Azores, and three weeks in Lisbon works for us! Azores Airlines is the new name of Sata Airlines. 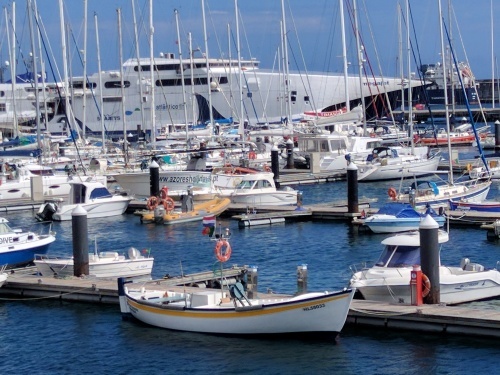 Due to the popularity of the non-stop service from Toronto, and Boston, to Ponta Delgada, there are now larger planes and more frequent flights. As always, on the ground and in-flight service was excellent. Notably, flight attendants were extremely helpful in assisting passengers to stow their luggage safely. The young immigration officer welcomed us back with a big smile. Since we had only carry-on luggage we were quickly off to Hotel do Colegio, our home for the week. Prior to the time we began renting an apartment, we stayed here and always recommend it to visiting friends. Originally a school, which Fernando Neves, the hotel owner, attended as boy, the building also served as the musical academy of the Regional Conservatory and has been classified as architecturally and culturally valuable. The design of the main doors, windows, staircase, archways and stone slab flooring are beautiful renditions of the typical masonry and local basalt work. In the past year there were substantial renovations externally and internally to update and refresh the original beauty. The corridors and rooms were redone in a soft brown, beige, and tan scheme. Our large, twin-bedded room, overlooking the pool, was beautifully furnished with ample comforts and conveniences, including free wifi. The swimming pool in the center atrium is a lovely focal point from all the public areas of the ground floor as well as the rooms above. Let us not forget the ample included breakfast buffet, an excellent selection of quality Azorean products and a self service coffee machine. There's open seating indoors or by the pool. 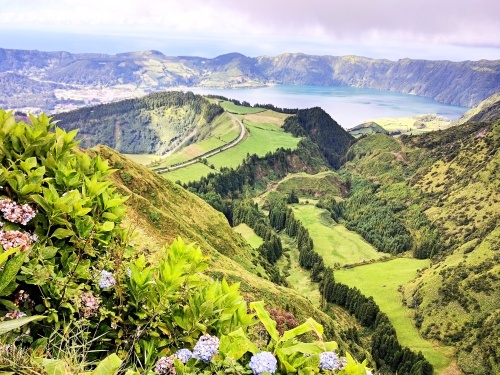 Due to its temperate climate, São Miguel is in bloom year round but since we've always visited in winter, we were anxious to see what Mother Nature has on display in September. Our friend, winter landlord and tour guide supreme, Eleutério, to the rescue! Eleutério picked us up at the hotel and we headed east to Caloura for lunch and to get caught up. 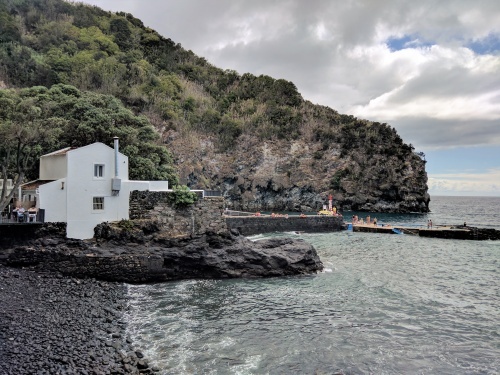 Caloura is an isolated paradise of calm and beauty situated on the southernmost point of São Miguel. Stunning white houses resting on manicured properties and vineyards defined by black stone walls lead to a small fishing port and beaches nestled between cliffs with a natural swimming pool formed by the rocks. Nestled in the port, Bar Caloura offers the "catches of the day", out of the water onto your plate. 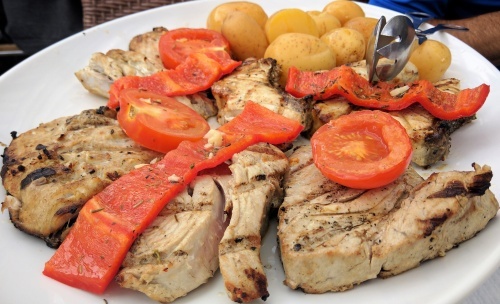 We shared healthy slices of tuna, liria and blue fish, grilled to perfection. After lunch we headed west through rolling hills of glorious pasture land with cows busily trimming the dense green carpeting. The hydrangeas lining the pristine roads were glorious in all their colors. 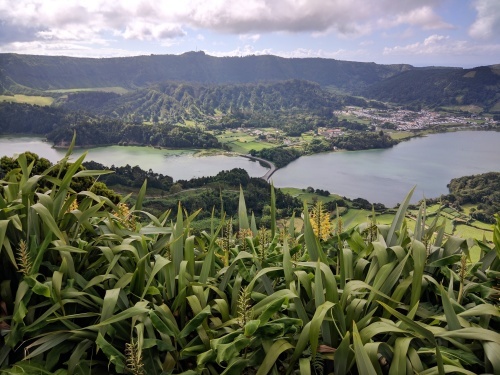 Our destination was Sete Cidades and its legendary blue and green volcanic lake. It's a compelling experience from the viewpoint at Miradouro do Cerrado das Freiras with hydrangeas and cryptomerias engulfing the crater adding a colorful spirit to the luxuriant plantings. The fog that skims the lakes, propelled by breezes, coming and going, rising and dropping, causing an array of changing scenes and colors as the sun moves in and out, sets the mood for contemplation. This clear blue, sunny, warm, calm September day enriched the brilliant colors of the surrounding flora and the blue and green waters. There are many walking, hiking and bike routes from lakeside to up on high. If you like a little comfort with your nature there are tables and benches near the blue lake and lake Canario for resting and picnicking. The five star Hotel Monte Palace was built in the 1980s on a hill above the lakes. It opened in 1989 and closed a year later. It was protected until early 2000 and after that every single thing that could be removed was looted. Now the massive skeleton has become a tourist attraction, which we visited to check out the magnificent view from within. With the improving economy there is hope of a rebirth. We stopped at many viewpoints to capture the essence of the beauty of the landscape and the surrounding ocean as they blended together. Eleutério dropped us off near Gelataria Abracadabra to pleasure ourselves with the most wonderful gelato. It's hard to believe you're not in Italy. The lovely staff are eager to please. This was our third visit this stay. This past winter we found the dentist we have always searched for, Dr. Pedro Almeida, a skilled practitioner with soul and charm. He was one of two main reasons we stopped off in Ponta Delgada. Make a note, you never know. You do not come to the Azores without eating fresh fish and seafood practically everyday. The varieties vary with the season but there are always many choices. Azorean tuna is highly regarded worldwide for its flavor, texture and purity (clean Azorean waters) and when in the mood we head to A Tasca, situated in a renovated old jail on Rua do Aljube, 16. It's all wood - beams, pillars, floors - the works. It's a hopping, cool, fun spot. The well-executed, creative menu is in the form of a newspaper, daily specials on a chalk board, and the list is long. You can be assured of quality Azorean products well-prepared, the Azorean way. Today, a tuna steak sandwich with housemade chips for Linda and a tuna steak plate for me. Linda loves the locally produced passion fruit drink, Kima, while I always opt for the local beer. We're always sad to leave the island, but we'll be back in January for 3 months and the really good news is that we are off to Lisbon. The Azores Airlines flight to Lisbon was on time and smooth. Lisbon is 5 hours ahead of Eastern time - flying time is approximately 2 hours and 10 minutes from Ponta Delgada. Since we had cleared Portugal immigration when we arrived in Ponta Delgada, we just followed our fellow passengers to the nearby Aeroporto red line metro station. The Via Viagem card is the easiest and most flexible way to use the transportation system. It was a 20 minute ride, with one change, to reach the Avenida metro station on Avenida Liberdade. From there it was 5 minute walk to our hotel. Hotel Lisboa, Rua Barata Salgueiro, 5 (at Av. Liberdade) was an excellent find. From the front desk to breakfast room and maid service the staff is attentive, friendly and helpful. Rates are reasonable for this level of comfort and service. Since we would be here for 3 weeks, we reserved the executive room which consisted of an entryway with wardrobes along one wall, a living room with a convertible sofabed, coffee table, desk and TV, a large bedroom with desk, chairs and another TV, and a good size bathroom, well-stocked with amenities. The rooms, with contemporary furnishings and hardwood floors, are soundproofed and air conditioned. A digital safe and fridge/bar are convenient and, best of all, there's very good lighting and free wifi. After a day of touring we found the cozy lounge on the ground floor very relaxing. The nearby breakfast room is bright, cheerful and very comfortable with professional staff looking after the ample array of offerings on the buffet. We particularly loved the raisin/walnut and grain breads. 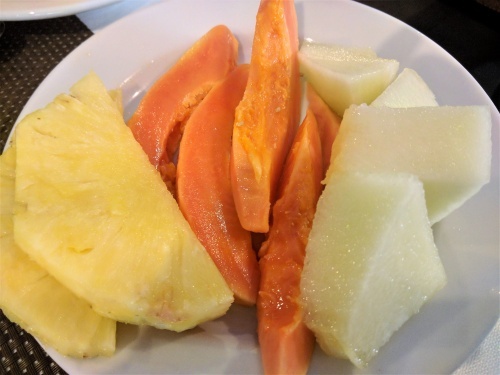 The highlight was the fresh fruit; melons, mango, kiwi, grapes, oranges were wonderfully fresh and tasty. Of course, a hot cup or two of cappuccino is always a perfect way to start the day. This is the Santa Marta neighborhood with many excellent, reasonably-priced restaurants and conveniences, including a brand new laundromat (Sem Mocas) just around the corner on Rua Santa Marta - clean, efficient and easy to use with free wifi to help pass the time. The master griller, Arlindo, is an artist. His spareribs are the best of the best, and fresh, meaty rabbit was done to perfection. Any fish you choose will make you smile. There are also many non-grilled traditional offerings that are as good as you can get. It's always packed, but you aren't rushed. The waiters are good-natured and will be happy to help you choose. 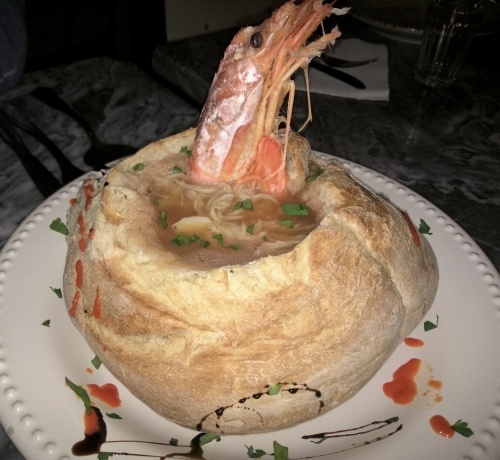 The portions are ample and the cost is reasonable. Wise to make a reservation. Around the corner on Rua Rodrigues Sampaio, 35 is Rubro,a totally different dining experience. The environment is ultra casual, highlighting their famous wine selection. The menu is eclectic; hams, cheeses, eggs, mushrooms, soups, salads, grilled meats, fish, etc. and wines for every offering. We were very pleased with the gaspacho, cod fish cakes and scrambled eggs with asparagus. The rolls and olive oil were delicious. Rubro is worth a visit. Note that seating for non-smokers is limited. We love this homey location in the middle of the city. 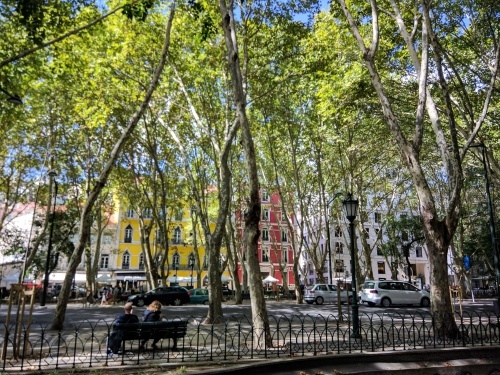 You can stroll along picturesque Avenida Liberdade to the city center or walk on the parallel, narrow, historic Rua Santa Marta which changes to Rua São José and finally Rua das Portas de Santo Antão (lined with restaurants) where it tumbles into the heart of town. For the weary, there is always the metro. Portugal is thriving, tourists are flocking in. This makes us very happy. We feel rewarded after years of reporting about this exceptional country. Change is in full bloom. It hit us as we started along the Santa Marta route. Many of the old buildings and businesses along the way are being rebuilt or renovated - and it's happening everywhere in the city with obvious growth in condos, rental apartments, and hotels. Praça Dos Restauradores leads into the busiest part of the city. 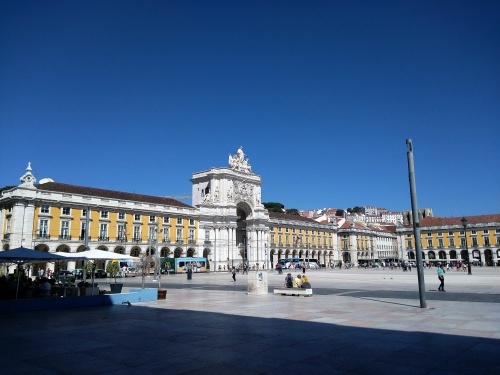 The central squares, Praça Rossio/Dom Pedro IV and Praça da Figueira with their large neo-classical buildings are the hub of social activity with theatres, restaurants and cafes dominating the scene. Hang around, have a coffee and absorb the pulse of the city. The squares are in full renovation mode as is the Baixa which links the squares to Praça do Comércio at the river front. Rua Augusta, is the gateway to the Baixa (lower town) and the thoroughfare to the Praça do Comércio. The Baixa is the commercial center of the city. It was built in a grid layout. The streets, flanked by neo-classical buildings, were named for the shopkeepers and craftsmen who traded there. We have always found the streets to be crowded, but now it has reached a new dimension. The wide Rua Augusta, with its many restaurants, cafes, bakeries and clubs is the beacon of activity and it was shining brightly. The winding streets of Alfama rise to the east (topped by the Castelo de São Jorge, which offers great views of the city). To the west is Chiado and Barrio Alto, the distinct character of each merits exploration. 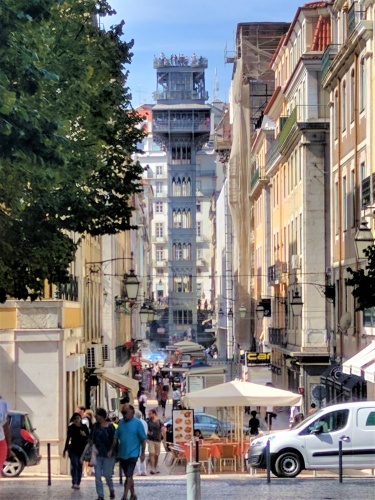 The most popular single attraction in the center is the Elevador de Santa Justa (also known as Elevador do Carmo), Rua de Santa Justa, in the Baixa and Largo do Carmo in Barrio Alto. It's neo-gothic design resembles the Eiffel Tower (the designer was an apprentice to Alexandre Gustave Eiffel). It's a unique experience and offers views of Rossio, Baixa, Castelo de São Jorge, and the Tagus. Walking up Rua do Crucifixo in the Baixa we stumbled upon Bella Ciao, Cantina Italiana at number 21, a kitschy trattoria with an inviting vibe. A very good find. A caprese salad with a twist, the luscious cheese and tomato serving was accompanied by a plate of more sliced tomatoes, greens and tuna. Fresh pappardelle with porcini mushrooms was simply done with olive oil and garlic. All was fresh, well prepared and very reasonably priced. We headed west along Rua Arsenal past the Lisbon City Hall to the Cais do Sodre (trains to Belem and Cascais and ferries across the river) area to visit the Time Out Market, Mercado do Ribeira, Av. 24 Julho. This massive food hall has something for every appetite. There are ongoing daily events and activities to spice up the diverse offerings. It's no wonder it's the hottest food attraction in Lisbon. We came after lunch to visit so did not have to fret over what to choose. The best part of our travels are the friends we have made along the way. We met Isabel online while planning our first trip to Portugal (spring 1997). She met us at the train station in Coimbra with big hugs and kisses and our friendship has endured for 20 years. We spent the rest of the day in the comfort of our hotel and at a nearby Pastelaria Portuguesa to fortify our dear friends for their drive home. When Linda was researching the best gelato in Lisbon, Google suggested Nannarella, located on Rua Nova da Piedade, 64a off of Rua de S. Bento. Oh my, what a treat! This tiny, neighborhood shop serves up generous portions of memorable gelato. The texture is dense yet smooth and creamy. Flavors are authentic and rich in intensity. The overflowing cups are topped with REAL freshly-whipped panna spooned out of a bowl (no extra charge). We became frequent users varying our routes, either climbing the hills or taking public transportation. If you miss Nannarella, your trip to Lisbon will be for nought. A fellow we met in the laundromat recommended two local restaurants, both of which were wonderful. Solar Passadico, Rua Passadico, on a parallel above Rua Santa Marta. Just walk up Tv. Parreiras and turn left at the top. This is a pure local traditional family tasca. Join the locals and eat well for little. The fresh cheese and bread to start were fabulous. One visit we had grilled pork steak and grilled carapau, another time we both had the grilled robalo. Lots of fries or boiled potatoes and fresh boiled veggies overload the plates. It's a load, but who can resist a coconut cream tort or mixed fruit cheese cake. Warm hosts, friendly patrons and good home cooking are reasons to return. Besides, it's a quaint neighborhood to explore. As the guy told us, take Rua Santa Marta north to the end where it becomes Rua Conde Redondo, take a right on Rua Luciano Cordeiro and enter Quick Asia at #63/65. The pleasant Asian atmosphere, sweet staff and delicate aromas indicated we might be in for a treat. And so it was, wonderful subtle flavors, quality ingredients and preparation made for a luscious lunch. The chicken soup, shrimp pad thai and chicken masala were better than any Thai we've had back home. All that, and very fair prices. We first met our dear friends João and Luisa in our online Travelzine discussion group and then, in person, here in Lisbon, exactly 13 years ago. 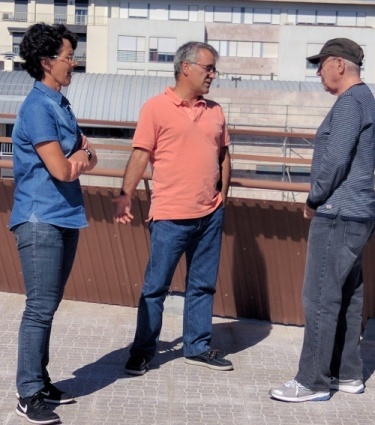 Over the years they have visited us in Toronto and Ponta Delgada and we have met in Lisbon. João picked us up and we were off to get Luisa and continue to the Expo area with beautiful parks, trails and lovely river views in the shadow of the cable-stayed Ponte Vasco da Gama, the longest bridge in Europe. It was a gorgeous day to relax outdoors, appreciate the fresh air, take in the lovely scenery and enjoy the company of our dear friends. Luisa prepared a fabulous lunch at home starting with fresh cheese, olive spreads and dense corn bread. The fish (grouper) rice was superb. A cool vinho verde was the perfect accompaniment. An almond caramel pie finished us off. Of course, João was the perfect assistant with an amazing talent for pouring wine. After lunch we drove across Ponte Vasco Da Gama to the town of Alcochete, which has had major development with the completion of the bridge. It started out as a fishing and agricultural village and now is considered to have the highest income per household in the country. Alcochete has a long standing bullfighting tradition and has the largest outlet mall (Freeport Designer Outlet) on the Iberian Peninsula. Just goes to show what a bridge can do. 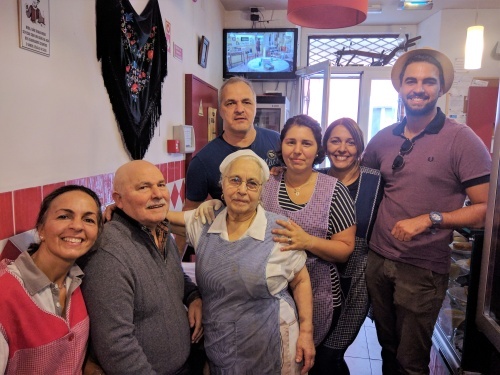 Our daughter tipped us off to the terrific Restaurante Tascardoso at Rua de O Século 242 at the corner of Rua de Pedro V in the northern part of Barrio Alto. We lucked into the last available table at the heart of lunch hour. All the food being served around us looked and smelled good. We chose grilled carapau from the daily offerings. Fresh salads were neatly presented in large, oval bowls. The corn bread rolls were wonderful. Large portions, good quality preparation, plus fair prices equals return visits. Forno d'Oro, R. Artilharia 1 16b, near Praça Pombal was a marvelous pizza find. It's all white interior featuring a golden, wood burning oven has a classy, comfortable buzz, a perfect spot to celebrate Linda's birthday. We started with bruschetta looking forward to a true Neopolitan delight as claimed. The "Diavola" pizza we chose was topped with San Marzano tomatoes, fior di latte, PDO mozzarella, spicy salame and chili. An authentic Neopolitan pizza, the crust was soft and chewy, the toppings top quality. The pie was baked perfectly in the golden oven for 70 seconds at 480 degrees (so we were told). Must have beer with pizza and the Letra, craft, made in Portugal was an excellent choice. The recommended Tiramisu was superb. Of course I let it slip it was Linda's birthday so along came the chorus with chocolate cake and candle plus an aperitif. Forno d'Oro is a wonderful choice when you need a culture break. Another opportunity for a change in diet is Tantura, Rua de Trombeta 1d, Barrio Alto, specializing in Mediterranean cuisine. 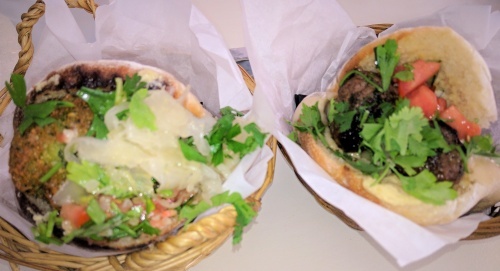 Lots of delicious, healthy choices to chose from; like hummus and shakshuka in a variety of ways, salads, daily fish and house-baked pita filled as you wish. We opted for the latter, one with falafel, hummus, tabule, cabbage and tahini sauce, the other with meatballs, Israeli salad and tahini. You know it's good when you are left with lingering mouthwatering fresh flavors. Vinho verde was a neat partner. Malabi, a milk pudding with rosewater, topped with peanuts, coconut and raspberry syrup, was a satisfying finish to the meal. Tantura is an easy spot to enjoy a taste of the Mediterranean. Frances, long time member now co-owner of TheTravelzine discussion group, was in town with her sister Helen for a couple of days before boarding their cruise ship. 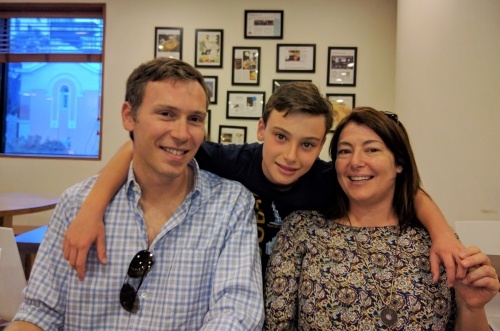 They joined us for dinner at Marisqueira de Santa Marta which gave us the opportunity to share our insights of this splendid city. Frances and Helen are ardent cruisers and we enjoyed their perspectives on this travel style. 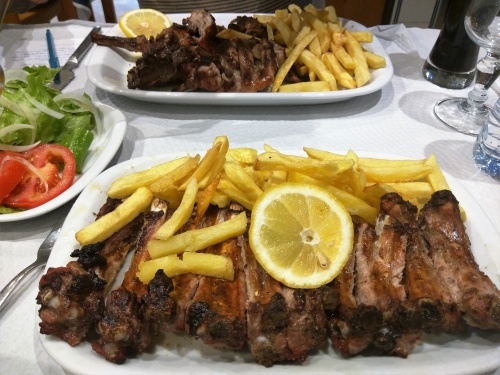 A friend from Ponta Delgada recommended Restaurante Zé dos Cornos, Beco dos Surradores, 5, off of Rua da Madalena, east of Praça Figueira, especially for the ribs. This is a tiny place with little room between tables. Every stool was filled with locals except for two at the far end of a long table in a back room. Fortunately we were slim enough to squeeze to the end without everyone moving out of the way. The entrecosto com batatas frita (baby back ribs with fries) was outstanding. We shared a generous whole rack along with salads and Super Bock Stout. The dense corn bread was awesome. Homemade chocolate mousse and pingo (expresso with a dash of hot milk, called garoto in the Azores) finished us off. Great food and prices - definitely best ribs downtown ! We had our last dinner near our hotel at Taberna Anti-Dantas, Rua São José, 196. Eclectic furnishings and walls covered in newspaper clippings make for an interesting space. Our waitress told us it was her first day on the job but we would never have known. Her amiable personality and desire to please was appreciated. It was evident that she was inspired by the owner Felipe, her friend, a sweet guy, dedicated to giving his patrons a memorable experience. But, the story continues. Felipe took us a few doorways away were he will open a larger place soon. It's glorious space with original stone archways, stone walls, high ceilings - it will be wonderful. He will continue to operate at #196 after the new place opens, in what form is yet to be determined. Felipe is a creative fellow so check it out when you are in town. When we stroll through the neighborhoods, smelling the cooking (still waiting to get invited in for lunch), I'm reminded of my grandparents, especially when I see the women washing the front steps or hanging out the wash or the men sitting on the porch playing cards. Swapping greetings sometimes leads to conversation and new acquaintances. Our appetites design our routes; we just keep moving, uphill, downhill with a smile all the way. P.S. This trip was committed to seeing friends, strolling the streets to discover what is new, visiting favorite eateries and finding new ones. We have written extensively about all aspects of the city and surrounding towns and suggest you read our previous travelogues for in-depth coverage. While youre at it, read all of our Portugal travelogues. Portugal belongs on your bucket list.